In your journey as a medical marijuana patient, you will become familiar with not just a variety of marijuana strains but also a plethora of cannabis related products. These include some that are somewhat commonly known such as cannabis edibles, wax and so on. However, while scanning over marijuana products at your local cannabis dispensary, you might see an interesting looking vial and ask yourself “What is Rick Simpson Oil?” While it may be one of the least spoken about cannabis products it might also be one of the most therapeutically potent and effective medical variants of cannabis available on the market. Rick Simpson Oil, which is also known as R.S.O, Phoenix Tears, fully extracted cannabis oil (F.E.C.O), comes from an unlikely starting place. Rick Simpson, the creator of R.S.O. (as evidenced by its name) created his powerful Rick Simpson oil completely by accident. The Rick Simpson story started in Canada in 1997. Rick was an engineer at a Canadian hospital and was working in the hospital boiler room trying to cover asbestos on the hospital’s pipes with aerosol glue. The boiler was very poorly ventilated and this caused the potent aerosol glue to start giving off toxic fumes. These toxic fumes caused Rick Simpson to have a temporary nervous system shock which then caused him to fall off his ladder, knocking him unconscious and badly injured his head. When he came to he got help from his colleagues and they rushed him to the emergency room doctors. This injury, however, had lingering effects for Rick Simpson. For years after the accident, he suffered from a ringing sound in his ears known as tinnitus and from dizzy spells. Even worse was that his prescribed medication had pretty much no effect at all on his symptoms. This caused Rick to start inquiring about medical marijuana as an option for his treatment after he saw a documentary that highlighted the positive medical benefits of using cannabis for a variety of illnesses. His doctor, however, refused to consider cannabis as a course of treatment for Rick Simpson‘s head injury. With no other plan or recourse, Rick started acquiring marijuana through his own accord and saw a tremendous improvement in his tinnitus and dizzy spells. So just as things started looking up for Rick Simpson, in 2003, three bumps suspiciously appeared on his arm. After getting them checked by his doctor and then taking a biopsy, they realized that Rick had basal cell carcinoma, a form of skin cancer. Citing the documentary he watched that caused him to treat his head injury symptoms with marijuana and also a study from The Journal Of the National Cancer Institute which stated that THC was found to kill cancer cells in mice. Rick Simpson decided he was going to treat his skin cancer with an extremely concentrated cannabis oil, which is now known as Rick Simpson oil. All Rick had to do was to think how to use Rick Simpson oil on his cancer. He decided to topically apply it to a bandage that he left covering his basal cell carcinoma bumps for several days. Within four days, Rick removed his bandages, and the growths had disappeared. Even though his doctor and other traditional health practitioners refused to acknowledge cannabis as the cure, Rick Simpson was completely overcome by his belief in the medicinal, healing properties of marijuana. From this point on Rick started cultivating and harvesting his own cannabis to create R.S.O. for other patients in need. Giving out his medical wonder oil, free of charge, to whoever needed it became his life mission from that point on. K.I.N.D. 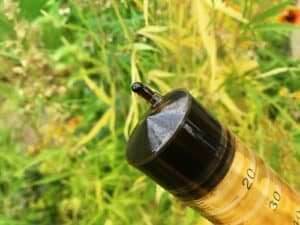 Concentrates makes Rick Simpson oil in the same exact manner Rick Simpson himself makes his R.S.O. Most concentrated brands don’t do that, but we want to bring you the exact healing elements that made the original Rick Simpson oil so legendary. Contact us anytime if you have any questions about Rick Simpson oil or any other concentrates or products. Rick Simpson Oil: Can You Use Phoenix Tears for Cancer Treatment? Is Medical Marijuana Legal in Arizona?